A chest clinic set up to help patients with learning disabilities has not only transformed their hospital experience but has also supported them to manage their asthma and saved money. 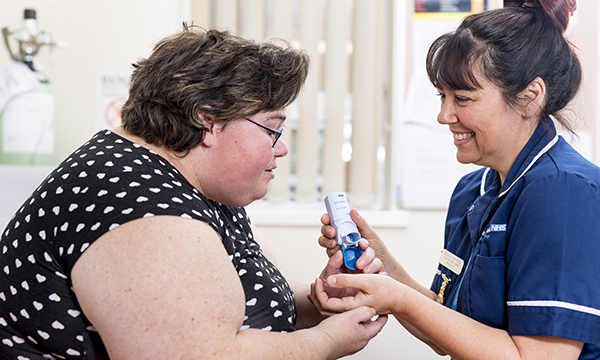 The asthma clinic at Sunderland Royal Hospital, run by respiratory nurse specialist Sharon Stothard, has proved so successful that it has been rolled out to support patients with learning disabilities who have any respiratory disease. After identifying 28 asthma patients with a learning disability who needed support, she embarked on a six-month project to help them improve their asthma management. It was a success. Evaluation showed a 25% reduction in this group of patients accessing the emergency department, ambulance services and out of hours GP services. ‘It is difficult to determine whether this decline is due to empowerment, greater understanding of self-management, compliance or a combination of all three,’ says Ms Stothard. ‘There were a number of patients known to the learning disability team who were frequently attending the emergency department, and then the review chest clinic,’ says Ms Stothard. She asked the data team to send her the names of those attending the emergency department (ED) every day. ‘A theme was coming through,’ says Ms Stothard. ‘These vulnerable patients were being treated but they were not getting the follow-up support they needed. What changes improved patient experience? ‘For me it was about empowering these patients to manage their condition by improving their experience in the clinic,’ says Ms Stothard. Patients are initially seen when they come into the ED to help continuity of care. They are then seen in Ms Stothard’s specialist clinic within a week of accessing emergency services. In the standard chest clinic, routine appointments lasted for only ten minutes. ‘The first two clinics I ran for patients with a learning disability overran by hours, as patients needed much more time – at least 30 minutes each,’ says Ms Stothard. ‘Now the first contact is mainly fact-finding and getting to know the patient, building a relationship with them. It is important to know what it is that they need to understand and what makes them tick, learning about them as a person. ‘These patients have high anxiety levels and often low levels of understanding and literacy. Central to this empowerment has been making sure they have the tools they need to manage their asthma. We have adapted self-management techniques in a creative way to meet the needs of these patients,’ she says. Self-management plans are tailored to the individual and are patient-centred. Many patients struggle to understand the literature available in a normal clinic, so easy-read versions were created, including appointment letters, asthma education leaflets and an easy-read self-management plan. 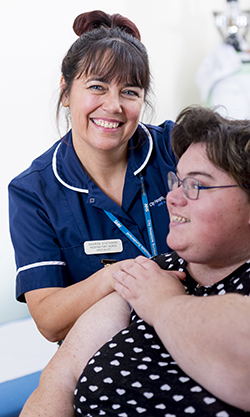 With the help of the hospital’s learning disability lead nurse, Ms Stothard developed a page on the Sunderland Action for Health website, a resource specifically for patients with a learning disability. It includes a video link to a demonstration of inhaler technique. ‘Some of my patients use that video twice a day to take their inhaler,’ says Ms Stothard. ‘It was quite simple to do but effective and not massively expensive. Previously, lots of patients had inhalers but nobody had checked that they could use them. There is also a text service alerting patients to pollen levels or bad weather, and the team visits patients admitted via the ED to assess and reassure them, ensure continuity of care and maintain the relationships that have been built in the clinic. Ms Stothard says there have been challenges, including maintaining plans when patients have several carers. ‘I’ve had asthma all my life,’ says Lynn, 29, who visits the chest clinic run by Sharon Stothard. She has been visiting the chest clinic for four years but previously only saw the respiratory nurse specialist occasionally. ‘When I go in to see Sharon I can talk about things, about how I am and how I’m doing,’ she says, adding that seeing her has been helpful. ‘We have developed strategies to address the lack of carer continuity for some,’ she says. ‘Carers come in and we teach them, and if the patient has respite care I go and teach the carers what they need to know to support the patient. ‘We also have a “patient passport” for our patients and every contact is put into it. One of our patients ended up in ITU because he was so stressed about being nebulised in A&E. Now we have a plan here to nebulise him while he is asleep, or when he is calmer,’ she says. Diane Palmer, deputy director of nursing at City Hospitals Sunderland and South Tyneside NHS Foundation Trust, says: ‘We are very proud of the fantastic work Sharon has been doing. Such simple steps make a huge difference in supporting our patients in managing respiratory diseases so they don’t end up having to make unnecessary trips to emergency departments and GP services. The specialist clinic was approved by the business management team at the end of the pilot. ‘We now have 40 patients and are managing these patients more effectively,’ says Ms Stothard. ‘We are saving on emergency costs, and the clinic didn’t cost anything to set up. ‘The initial project only encompassed asthma patients but was such a success that the service has now been rolled out to all respiratory patients with learning disabilities, including sleep apnoea, lung cancer, chronic obstructive pulmonary disease and tuberculosis,’ she says.